Father William, born and raised in Newfoundland, came to B.C. as a teacher in 1989. He first taught in Tahsis on Vancouver Island and then was employed by the Island Catholic School System, first teaching at Queen of Angels School in Duncan before moving on to St. Andrew’s Regional High School in Victoria. After responding to a call to the priesthood, he was ordained on August 15, 2004 by Bishop Richard Gagnon. He then spent one year as assistant pastor at St. Elizabeth’s in Sydney, B.C. 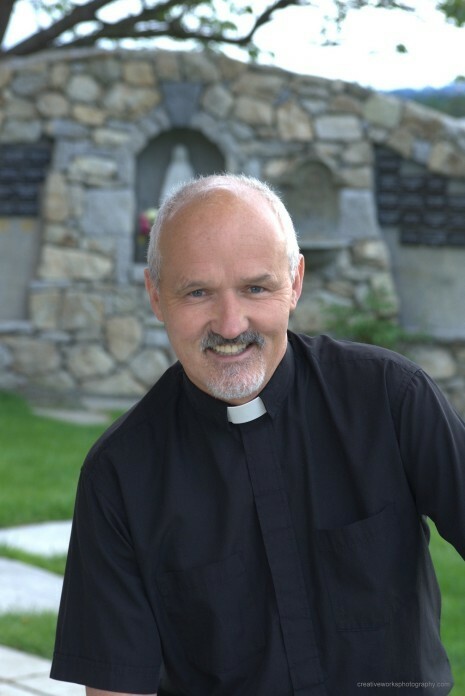 and from 2005 to 2006 he did a residency in clinical pastoral education at the University of Alberta hospital before being appointed pastor at St. Joseph the Worker parish in May of 2006. In July 2015, after nine satisfying years at St. Joseph the Worker, Fr. William will move on to be Pastor of Holy Cross Parish in Victoria. Being ordained at an older age meant that Fr. William brought much life experience to his ministry along with a depth of understanding and great compassion for the people he ministers to. Besides being a dynamic parish administrator, he also utilizes his gifts in a variety of ways. He is presently the Episcopal Vicar of Diocesan Catholic Schools and Evangelization, and a member on the Island Catholic Schools Board of Directors. He is also the past Vice President of the Western Federation of Priests. Fr. William is a ‘generator’. While being utterly faithful to the teachings of the Church, he generates new ideas, new initiatives and new ways of bringing the seeds of faith to life. He doesn’t avoid difficult issues but challenges people to stretch their boundaries and to view themselves as his co-workers in Christ, ministering to the wounded, the poor and the marginalized. He recognizes his parishioners’ gifts and talents and encourages and helps people to minister to one another and to the world. He leads by setting an example and he leads with joy and enthusiasm. No bio of Fr. William would be complete without mentioning Ben, his gentle, loving and ever patient Dachshund. Wherever Fr. William is, Ben will usually be there as well, greeting people with a friendly wag of his tail – a true companion on the pilgrimage.